With a bunch of new Spring releases right now I thought it was the perfect time for a wish list post of things I have my eye on. From a candle that smells like my favourite face mask to a nail polish set to die for and the best beauty box I've ever seen! First up a new foundation on my list that's actually an Amazon exclusive straight from the US! While I haven't heard much about this foundation I do love the L'Oreal Infallible matte foundation line and a glow-y edition would be well loved in my makeup bag. Described as a light foundation with radiant, healthy glow finish to give a boost to dull or dry skin along with medium coverage, it's long wear formula lasts up to 24 hours and hides imperfections for a smooth, clear complexion. The foundation, available in 12 shades, is perfect for normal or dry skin in need of hydration. The reviews of this new-to-the-uk foundation have also been amazing with 93 customer reviews giving it mainly 4&5 stars. This has to be the next foundation I pick up! When it comes to buying beauty books it's easy to end up with something that's basically a load of fluff that you can skim read within 30 minutes and never open again. So when I come across something with substance that's written by an expert or someone with a lot of knowledge in that field I jump for joy. The Skincare Bible is just that, written by an actual doctor and packed full of solid information on how the skin works, skin complaints and how to solve them and how to create a skincare routine for your skin type. This really does look like a really good read for anyone interested in skincare. Makeup Revolution has recently launched a new sister brand, Revolution Pro, and while there isn't much information about the new brand it is available both on the Tam Beauty/Revolution Pro website here and Superdrug online + in selected stores! For now, the range that has been grabbing my attention are the premium looking Supreme Matte Lip Pigments that come in over 30 shades and look very similar to Nars Powematte Lip Pigments! Not only is the shade range varied with lots of lovely nudes and pink tones but from the reviews I've seems the formula is ultra long lasting even through eating while being comfortable on the lips. For only £4.00 a pop these really are a bargain and something I was to get my hands on soon! When Latest in Beauty collaborate with a brand or for a special event you know it's going to be good. I've purchased many of these limited edition style boxes in the past and loved them however until now there hasn't been a choose your own products DIY style beauty box other than opting for the standard LIB box which is still good but never as good as the extra special boxes. 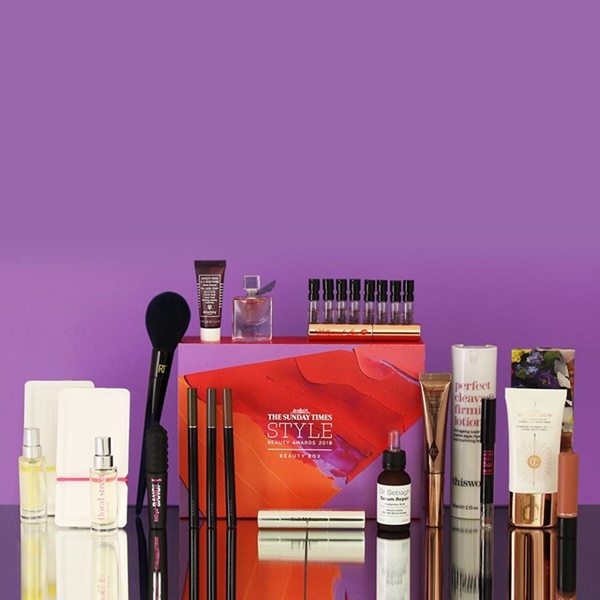 So when I heard about this pick-your-own box in collaboration with the Sunday Times Style Beauty Awards I rushed onto the website to see the section and it literally blew me away! This is by far the best selection of products, a lot full size, for only £25! While products from Charlotte Tilbury & This Works have gone for now (they will be restocking!) there's full-size MAC, Essie, Lancome and The Body Shop products to be had! I'm personally holding out for now in the hope I can add a few Charlotte Tilbury products to my box once they come back in stock but CT or not this beauty box is worth way more than the £25 price tag and can be filled with some amazing full-size premium products! Both circle and straw bags are in this season so when I spotted this little cutie it was a match made in heaven. I love structured bags like this as they never lose shape and surprisingly can hold essentials while looking compact. A bag perfect for both spring/summer and is pretty affordable! Just last month Herbivore landed exclusively on the Space NK website and I know many were excited about it! With ultra instagrammable packaging and non-toxic formulas, this is the clever millennial girl's skincare brand. Consisting of bath products, mists and masks this new launch has many an item I'd love to try out but for now the Pink Clay Exfoliating Mask is calling me. While this does have a £20 price tag (actually not bad compared to some of the other products) it's, in fact, a clay-based powder that you mix with water to create a paste so a little goes a long way! The mask also contains no fillers or nasties and includes my favourite, french pink clay. I really love the look of this mask! As Spring is finally here I'm on the lookout for some new additions to my wardrobe. Loving a bargain I came across this lovely tea style wrap dress on sale for £16.00 plus an extra 10% off! As Spring (and summer, unfortunately) can be cool I love that the dress is long sleeved and can be dressed up or down according to the shoes you pair it with - white converse or tan sandals would look great. The sale also consists of some other lovely pieces that are worth checking out. While browsing the new-in section on Cult Beauty, something I find myself doing too often, I came across this stunning Nails Inc Trio that I instantly had to save to my wishlist on the site! In general, I'm a huge Nails Inc fan due to their long-lasting formulas and easy application so I love discovering new shades. Within the set there's a lovely pastel rose pink, a gleaming dusky rose gold and a glistening pale gold that comes in a tin to store them. I'm very tempted! Let me know if I've tempted you with anything here!